Preheat oven to 325 degrees. Coat bottom and sides of a springform pan with cooking spray. In a medium bowl, stir together cookie crumbs and melted butter until well combined; evenly press into bottom of pan. Bake 8 minutes or until crisp. In a large mixing bowl, using a mixer on medium speed, beat cream cheese until creamy - about 2 minutes. Beat in granulated sugar and vanilla until incorporated. Beat in melted chocolate until incorporated, scraping down sides of bowl. Beat in eggs, one at a time, until just combined. Pour batter over crust, and swirl peanut butter into the mixture. Bake 55-60 minutes or until well risen, set, and only slightly jiggly. In the last five minutes of baking, sprinkle peanut butter cups over the top. Cool on a wire rack for 1 hour. Lightly cover and refrigerate until cold - about 4 hours - or until ready to serve. 48 comments on "Chocolate Peanut Butter Cheesecake"
I think you forgot to mention that this cheescake dropped out of baker's heaven. Holy cow that looks heavenly! Drooling at my desk! must.make.asap! I would think any cheesecake you make would be better than CF's. After all, those are sugar bombs made in big commercial kitchens with all kinds of mystery ingredients. You make things yourself, homemade, with love. I'd totally take that over a CF slice. I do love your travel posts, but welcome back cake! What a pretty cheesecake! I love the swirls on top. wow. no words except YUM. maybe that should be my bday cake! Oh, that just looks wonderful. :) I've missed your recipes, thank you for finally posting one! Btw, the next time you go to Cheesecake Factory you MUST try the Godiva cheesecake. It is so decadent and rich, and its so good. I <3 Cheesecake Factory too and I think I've gone enough times to taste most of the cheesecakes and a great deal of the entrees and appetizers as well. lol! I think I wanna spend more time with that cheesecake too! I adore your blog - and this cheesecake is a droolfest. I look forward to hearing more of your trips, your cooking - and if you ever move to the New York area, please come for tea! 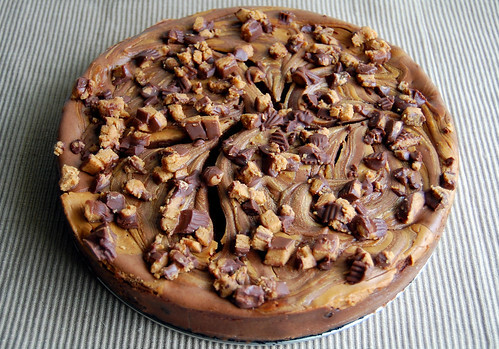 You are just plain fun..
Oh Emily, this cheesecake looks fabulous....chocolate and peanut butter, who can resist? Maybe you could introduce me to that cheesecake's twin brother, and then I could hang out with him?! Haha looks good! I am drooling at my desk... cant wait to make this! Just looking at it is driving me crazy. Do you think you'd be willing to lend me your cheesecake so I can ask it to marry me? I knew I shouldn't of clicked over from Twitter, now I am craving me some choc. and pb! Love this dessert! 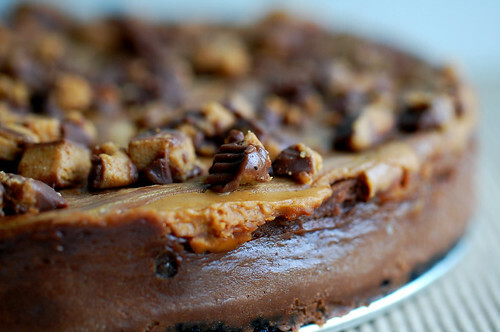 Your blog makes me want to be a better cook AND baker...wow, that cheesecake looks unbelievably good! But please don't stop blogging about trips and contests. I like that part, too. Yummy! My mouth is watering just looking at this beauty...fabulous creation! I've got to make some of this for dessert this week. Yowza! It's like you knew it was *almost* my birthday and posted EXACTLY what I want someone to give me. Why, why don't I have any local baker friends?! That looks so delicious!! 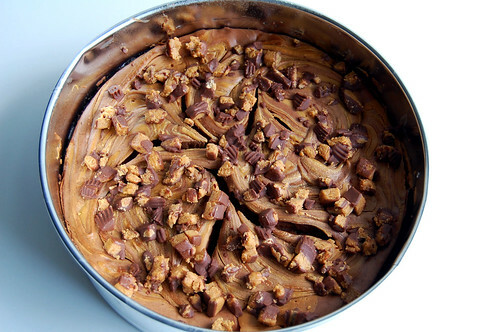 Peanut butter cheesecake = best idea ever. 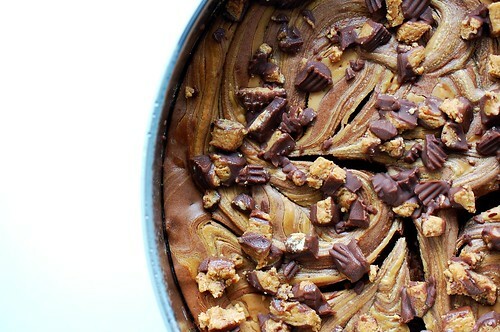 Giant peanut butter cup in cheesecake form come to mama!!! My boyfriend is going to LOVE you. oh holy mother of elvis!!!! does that ever look gooooood!!!! anything with chocolate and peanut butter has to be delish!! Hot and bothered? Lol! Cheesecake has that effect on me too. Now if you could just ship me one out for my birthday next week, I'll be mighty grateful. Thanks. Welcome back. I love reading/making your recipies and have missed your food posts. Can't wait to try this yummy looking cheesecake. This sounds delicious - have you ever tried making smaller, individual sizes of these? Like in a mini-muffin pan? That looks so delicious! Looks like it came straight out of a professional bakery - yum! Is this cheesecake more dense and rich or light and fluffy? WOW! That is one gorgeous cheesecake! I would love to have the tiniest sliver of it right about now! haha this is such a fun post! and that cake. oh my. have mercy! Oh my! You could sell that for a hundred bucks a slice. Where can I send my money? That cheesecake looks soooo good, I can't believe it stayed intact long enough for you to take those glorious pictures. wow!!! If only this were a bit healthier!! hahaha. I love chocolate & peanut butter though! This recipe is just what I have been looking for! It reminds me of a slice of cheesecake my husband and I shared while on our honeymoon. I will have to make it for him soon! Also, I would love to know if there are any salons that you would recommend in the Springfield area...I just moved to Branson and am at a loss...I have curls too. t, I'll have to try that one next time. Sounds great! Barbara, will do. I love tea! Pamela, thank you so much! I'm glad you enjoy those posts. 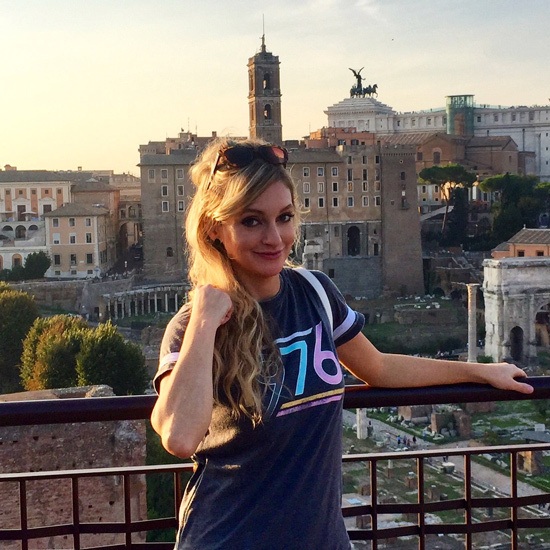 I like writing about trips. Nicole, I haven't tried but that's a great idea. Katherine, I would say more rich and dense. Sandy, I love anything with peanut butter, so I think I would like what you grew up eating. Playing catch up on your blog and you're KILLING me! Love how your wrote this post TO the dessert! I made this cheesecake for my brother's birthday this weekend and everyone loved it, even a very picky child who doesn't like to try new desserts. So my sister is turning 29 and the only thing she asked for was a peanut-butter chocolate cheesecake. I just typed that into Google but scrolled down a little way, instead of picking "allrecipes" or something. Your blog looks nice and the cheesecake looks amazing. I can't wait to try it. For a relative cheesecake novice, so you have any tips? Hi CherBear, thanks for visiting! Thanks for picking my recipe. :) That makes me feel good. Well, cheesecake is pretty easy to make. Make sure your cream cheese is softened. The more you beat the eggs, the fluffier your cheesecake will be. Less beating=stiff cheesecake. It depends what your sister likes. Thank you for sharing!!! One ? I do have is what size spring form pan did you use for this recipe? One ? I have is what size spring form pan did you use? I made 3 cheesecakes 5 yrs ago for my daughter's wedding (they didn't want a traditional wedding cake) and the main one was a peanut butter chocolate but for the life of me I can't find the recipe so was searching via google & found yours ~ & I'd like to make it for their 5th wedding anniversary next month. Hi Anne! Welcome! I hope you enjoy the recipe. I used a 10-inch springform pan.